According to the U.S. Department of Energy, heating and cooling takes up more than half of the energy consumed by an average household and inadequate insulation and air leakage are the leading causes of energy wastage. Thus, with proper insulation, residents stand to save money, especially for those living in states like Virginia that tend to experience inclement weather. Moreover, in the long run, this initiative would help conserve the nation’s limited energy resources. Most exterior walls have insulation in between the wall studs but allow significant energy loss through the studs themselves, which are poor insulators. This is called “thermal bridging.” Insulated siding improves energy efficiency by reducing thermal bridging. 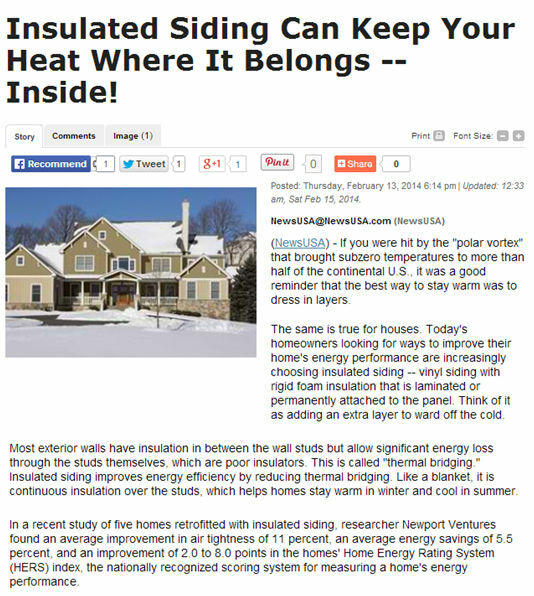 Like a blanket, it is continuous insulation over the studs, which helps homes stay warm in winter and cool in summer. Designed to reach higher levels of rigidity, stability and thermal resistance — “R-value” — insulated siding is subject to an array of regulations, standards and third-party quality assurance tests that determine how it is manufactured and marketed. While there are several options for you to insulate your residential or commercial property, it is always recommended to seek professional advice from Peak Roofing Contractors. Aside from major improvement jobs, you can also hire them to get Manassas, VA handyman services since they also perform carpentry work and other small jobs. Find out more at their website: www.peakroofingcontractors.com.